The layout at Bird Creek is both challenging and relaxing, featuring one of the "Thumb Area's" finest daily fee golf experiences. From the first tee to the final putt, this course is one to remember. At Bird Creek our landscape boasts gently rolling terrain that winds through tree-lined fairways. It is not uncommon for players to glimpse the gorgeous native wild fowls that call this area of the country home. Bird Creek Golf Club holds a special spot among my past designs. The golf course is the essence of Port Austin. The golfer experiences Lake Huron breezes, the grindstone, the farms and the warmth of its citizens. Bird Creek Golf Club is the result of years of anticipation, planning and concentrated efforts of many townspeople. As the course evolved from dreams and design to soil and sod the Port Austin residents kept pushing ahead, making the course "Number One in the Thumb." The 6,508 yard layout was designed to fit the rolling contours adjacent to Bird Creek, which meanders from the south through the course toward Lake Huron. 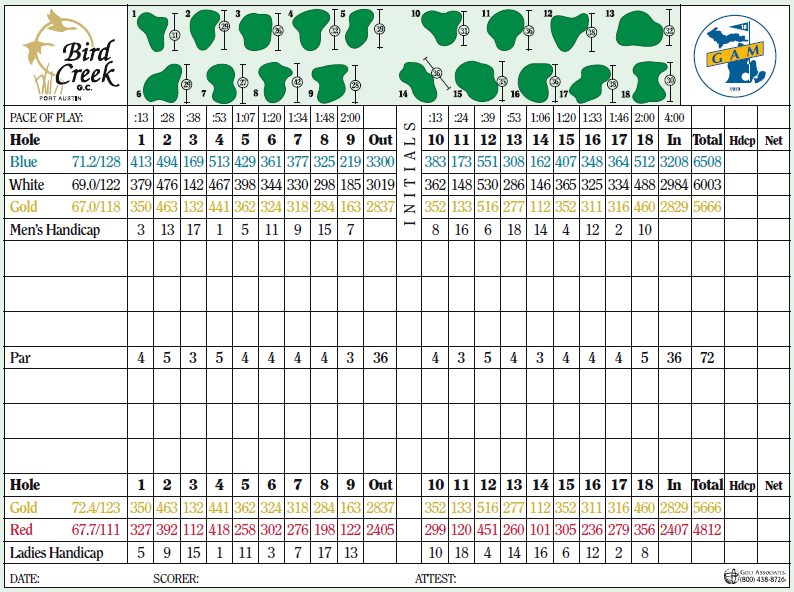 Eight of the eighteen holes play adjacently or over the creek, challenging all levels of golfers. The bunkering and ponds increase the difficulty for the better golfer, yet are placed to let the higher handicap player have an alternate route to the pin. Shifting Lake Huron winds come from three directions, making each round play differently. The finishing ninth and eighteenth holes are two of the most aesthetic and challenging you will play anywhere. ​Bird Creek Golf Club has a sense of place that all golfers will respond to by putting the course on their "have to play list." My association with the land, the course and the people has been a true pleasure. In 1987, the Port Austin Men's Golf League was playing their weekly competition at Pointe Aux Barques Golf Club just outside of Port Austin. Pointe Aux Barques Golf Club is a private, residential, 9-hole facility that was constructed in the 1800's and serves the summer residents of that community. This facility has a storied history itself as one of the oldest facilities in the state of Michigan. 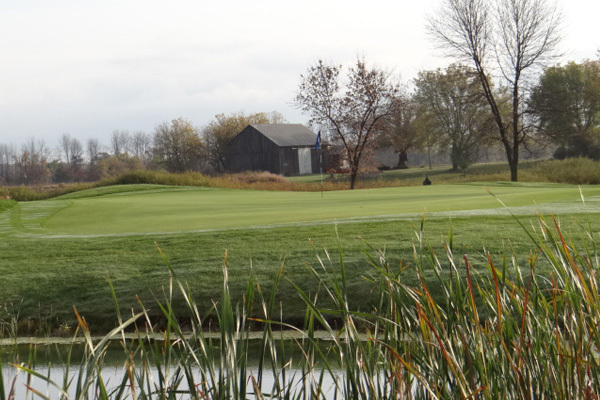 As the Port Austin Men's league continued its play at "The Pointe" in 1987, the men brainstormed the feasibility of having their own course to play at. Initially, the idea was just a pipe dream. There was so much to know about how to get started and who to provide the leadership for such a large project. Although there were a lot of unanswered questions, that didn't dampen the idea and the talk went on as the season continued at Point Aux Barques. Eventually, the men of the Monday night league decided to start the research and contacted architect Bruce Matthews of Lansing, MI. ​Raw land was acquired in 1988 just south of Port Austin. Three local farmers agreed to sell a portion of their farms to the now formed Bird Creek Golf Club, Inc. The name taken from the tributary that runs to Lake Huron through the land that the course is on. Plans were developed by Bruce Matthews and a blueprint of the course laid out. Preliminary cost estimates were done and then the creative marketing began led by the first President Gary Babcock. Meetings were held to help answer questions about the project, with many community members in attendance. ​To raise capital Bird Creek needed to sell shares in the corporation. For $2000 each, investors could buy a share in the golf course. Eventually, 250 shares were sold, many to local residents who wanted to have a golf course in the area. For many generations the community of Port Austin has served as a vacation destination for thousands of visitors. Already well known for its beautiful shoreline, sandy beaches and bountiful fishing, the community decided that one more popular form of recreation should be added. As construction began, so did the huge outpouring of volunteerism. Sixty people at a time were on the site from day to day to offer their help. From picking rocks to trenching, seeding, moving dirt and anything else that had to be done. Individuals offered their heavy equipment when available. Work was done at night with just headlights from vehicles. This was a good old- fashioned 'work bee' in progress. Under the supervision of architect Bruce Matthews and greens shaper Glen Caverly, the construction continued through1989 and into 1990. What seemed like an insurmountable projectwas starting to take shape. The countless hours of volunteer help continued. With the maintenance crew, construction crew and volunteer force working all day, everyday, a golf course was beginning to evolve. On Thursday, July 26, 1990 all of the volunteers who worked on the course celebrated the completion of the major construction of the course. The following day the course was opened for play. On the last Monday in July 1990, the Monday Night Men's league played their first nine-hole competition.